What breaks your heart and what makes you come alive? 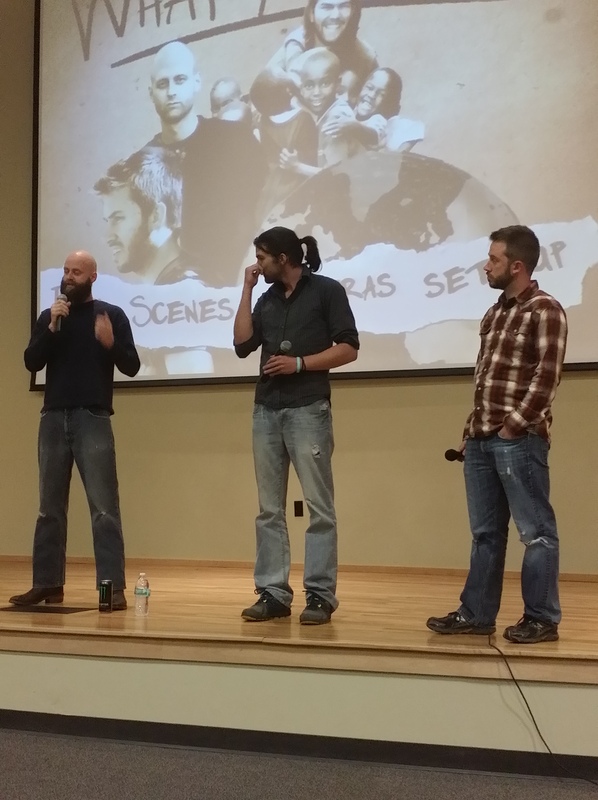 On Tuesday April 15, three local filmmakers visited SCC campus to ask its students these questions. In 2011, Dan Parris, Dave Peterka, and Rob Lehr decided to see what life was like living in poverty from their hometown of St. Louis all the way to the heart of Africa. Along with their cameraman, the young men documented their journey living on a $1.25 a day. That morning, Dave and Dan opened up the previously titled “Give a Damn” workshop by explaining a little about themselves. The local St. Lousians attended STLCC and came together to spread the word about life in poverty. Dave and Dan being dedicated Christians hoped that this documentary would throw the world into a radical change. The film “What Matters” isn’t a vision quest about themselves but focuses on things people in poverty have to suffer from and answers some questions concerning that culture. Students that attended both the workshop and the film presentation were touched by what they saw and heard. The Q&A portion of the night was filled with heartfelt concern and praise. The group of friends continue to reach out to what breaks their hearts. Rob is constructing a backyard war zone called “Thunderdome,” where kids and young adults alike can come and battle using Nerf warfare. His next documentary focuses on a problem he personally suffered from and he sees in kids who waste their lives playing video games and remaining static. Dave went back to Africa to aid women suffering from sexual abuse and human trafficking in a documentary titled “When the Saints.” Dan is helping both men produce these films through Speak-Up Productions which he created. Speak-Up productions also make videos for other non-profit organizations. Although the three men continue to reach out to those in need, they stated that they would not embark on another journey like this again. Dan said it best in his description of his feeling during the making of his film: “Living in poverty [for us] was like being on a lifeboat with a rope back to the ship. People in poverty don’t have the safety net in the back of their mind.” He encourages all to find something that breaks your heart and use what you love to fix it. April 21, 2014 in Campus Life, Christopher Null.